BOSS is a division of renowned Japanese musical equipment manufacturer, the Roland Corporation. Effects pedals, multi-effect pedals, electronic tuners and pedal boards formed the basis of their output for many years and today they have expanded their product line to include digital studios, rhythm machines and other electronic musical equipment. Their first products emerged in the mid 1970’s. The B-100 came with a clip-on pre-amp and pickup to amplify acoustic guitars, then the CE-1 Chorus Ensemble, which was a stand-alone unit of the chorus/vibrato circuit found in the Roland JC-120 amplifier. Their line of compact pedals began in ’77 with the release of the OD-1 (overdrive), the PH-1 (phaser) and a parametric equaliser called the Spectrum (SP-1). Every year after they would go on to release pedals and units that became staples from practice rooms to legendary albums on shelves around the world today. Their DD-2 Digital Delay, was the first mass-produced digital delay in a compact pedal format, later versions featured on the pedal boards of the likes of Prince and Thom Yorke and Slash. In ’92 they released 9 new pedals, including the Turbo-Distortion (DS-2) (used by Kurt Cobain and Steve Vai) and the Heavy Metal (HM-2) distortion pedal which would go on to shape the sound of much heavy metal music since. Their range today includes their best-selling single guitar and bass pedals, multi-effects units, guitar synthesizers, digital recorders, loop stations, acoustic pedals, vocal efx units, amplifiers, tuners and metronomes. Turn your guitar to an organ... Every now and then comes a pedal like the BOSS MO-2 and changes the way you play guitar. The Boss MO-2 Multi Overtone is a pedal effect that adds overtones to your playing. That changes your original tone to an enriched, wide and expressive organ-like one. Thanks to its integrated Multi-Dimensional Processing and the custom DSP, The MO-2 brings your sound to another level with harmonically saturated sounds. Not only that, thanks to a stereo output you can connect the BOSS MO-2 Multi Overtone to two amplifiers and create a wide stereo sound. We think this one will become a legend. Classic tremolo. Compact pedal. The BOSS TR-2 Tremolo is designed to provide guitarists with classic tremolo effects in an easy-to-use compact pedal. Dedicated "Wave," "Rate," and "Depth" knobs provide a multitude of effect possibilities, you can really fine tune the BOSS TR-2 to your liking. It is low on knobs but really lacks nothing as when it comes to versatility. An amp booster overdrive! The Boss OD-3 is an analog overdrive pedal effect which many guitarists use as a boost to push their amp rather than a traditional overdrive. The main reason for that is the OD-3s impressive dynamic range. Thanks to its two stages overdrive circuit, this pedal delivers rich and powerful sound and is in fact pretty versatile. A lot of users recommend the BOSS OD-3 for the blues-rock player, we however feel it can cater to many more styles. Multi-Dimensional Processing, intuitive layout and low noise ratio are making the BOSS CP-1X a prime guitar compressor pedal effect! The CP-1X is a result of BOSS taking their compressors to the next level. Thanks to their MDP technology along with the 18 volt electronics the CP-1X is a dynamic and transparent compressor with enough headroom to keep your signal clean and tight. The intelligent circuit of the CP-1X analyses the player's signal and applies compression based on that to each frequency differently, resulting in musicality which resembles a studio compressor than a guitar pedal compressor. Often, guitar players find it difficult to set the right amount of compression they seek for, with the BOSS CP-1X this task comes easy, thanks to the gain reduction indicator which displays how much compression is being applied. Simply put, the BOSS CP-1X is a great compressor and we recommend trying it out. The chorus you always wanted! In BOSS' portfolio several chorus pedals can be found. The legendary CE-1, The CE-2 which is now available under the Waza Craft series and more. What differs the CE-5 Chorus Ensemble from the rest is that it lasts, and for a reason! The BOSS CE-5 is considered as one of the most versatile chorus pedals the Japanese company ever made thanks to the high and low filters and the wide frequency range it provides. The shimmer of this pedal is sweet and it does not fall in the "flat" trap many chorus pedals do. There is a mild confusion as to wether the CE-5 is digital or analog and both are correct: The BOSS CE-5 started it's life as an analog pedal, but after 2001 the circuit was changed to digital. The one you hear on TonePedia as a brand new one, hence, digital. Boss keeps on pushing boundaries! The DD-7 accepts a great inheritance and delivers all the way, fitting even more options into this compact delay unit. The delay time has been expanded to 6.4 seconds and the built-in looper can record up to remarkable 40 seconds. In the main mode the DD-7 sounds as pristine and clear as its beloved predecessors. But on top there's a modulation mode, an analog mode and reverse mode - all sounding very good! Furthermore, it has stereo outputs that can be used to create freaky effects or to split the signal into a wet and a dry path. Another great improvement is the external out for either an expression pedal or a tap switch. All in all, we think this is an incredible pedal, considering its size and prize! The most famous distortion there is? While there is a debate on which Distortion is the most famous one, the BOSS Metal Zone MT-2 is definitely a respected candidate. It is one of BOSS's most sold pedals and is known to deliver some of the most extreme distortion sounds known to human kind. If we had to choose one word to describe the MT-2's sound it'd be "middy", this pedal has such a distinct mid range, it cuts through everything. The 3 band EQ helps you control the Low and High frequencies and furthermore the amount of Mid range you'd like plus the actual range! The Gain knob goes from "distorted" to "the most distorted ever", you can really get a compressed, wall of sound saturation from the BOSS MT-2.Analog or Digital?We have noticed the ongoing debate and confusion over the web as to the BOSS MT-2 circuit. Here it is once and for all: The BOSS MT-2 is a 100% analog pedal. The vintage delay spirit in the BOSS collection. Ever since being discontinued way back in 1984, the BOSS DM-2 Delay pedal has remained highly sought after by players everywhere for its warm, âbucket brigadeâ analog delay tone. Now, the DM is back! With the Waza Craft DM-2W, the coveted stomp has been reborn with switchable sound modes and greater versatility for todayâs music styles. Using 100-percent analog circuitry, the DM-2Wâs Standard mode nails the lush sound and 20-300 ms delay range of the original DM-2. Flipping into Custom mode instantly changes the sound character to a cleaner analog tone with over twice the available delay time. The WAZA CRAFT SD-1W is still the beloved BOSS SD-1, only cleaner and with a twist. If you play guitar you probably have heard the name BOSS Super Overdrive 1 somewhere. Heck! even people that do not play guitar have heard it. The SD-1 is one of the most famous overdrive pedals out there and that's exactly why we are so happy BOSS decided to give it a positive facelift under their WAZA CRAFT series. Just like other WAZA pedals, the SD-1W enjoys an all analog circuitry using premium components. The result is a cleaner, smoother SD-1. "You said a twist..." Right! the SD-1W has a 2nd channel, it's called "Custom" and it's great. Switching to it will regenerate the legendary SD-1 with more gain, more bass and in general simply more power. The beauty of it all is, that rather than competing against each other, both channels complete one another in a perfect way. The BOSS CH-1 is a crystal clear guitar chorus with a unique stereo output feature. The BOSS CH-1 has been around since 1978 and is one of the most famous chorus pedals out there. The CH-1 is equipped with four knobs for ultimate control over your tone: Effect level (dry/wet mix), EQ, Range, Depth. Also it offers a unique stereo output for those who seek to play it through a stereo amplifier such as the Roland Jazz Chorus. Auto Wah, Talking Wah, Wah Wah Wah. What a great effect is Wah, right?! The BOSS AW-3 Dynamic Wah offers a wide range of Wah effect types to get you going. We found it to be sensitive to your playing and extremely versatile, working for both electric and bass guitars. A great feature of the AW-3 is it's 'humanizer' function which simulates human vowel sounds, it just sounds so cool and different to the traditional wah, we had great fun with it in the studio. Control the BOSS AW-3 via tap tempo or an expression pedal, set to your selection of sound and funk away! The BOSS ODB-3 is an aggressive, new-age style pedal, which although called an overdrive, in reality is much more! It's a compact effect pedal, straight forward and easy to use. We do not see it as a pure overdrive, as it can roar and scream as a distortion too once the gain knob crosses the 12 O'Clock mark. But a great thing about the ODB-3 is, that even at maximum gain, it retains its clarity and focus, thus, cuts right through the mix!If you play Punk, Hard Rock, Trash, Metal and anything really that requires an "in your face" gain sound, be sure to check the BOSS ODB-3 out. The BOSS CEB-3 Bass Chorus is a pedal that was created with the bass player in mind. Often bass pedals either kill or mud up the lows of the bass guitar, and us bass players love our lows, right?? right! That is why the CEB-3 is such a great bass chorus - it keeps the low end of your bass as you like it, while colouring the high frequencies with a rich and organic chorus effect. To gain this low end clarity use the low filter control knob. In combination of it with the Depth and Rate control knobs which let you set the chorus to be just as you want it, you're pretty much set to go.As we wrote earlier, the BOSS CEB-3 is simply a great bass chorus pedal, point. From small venues to the biggest stadium stages, the BOSS DS-1 Distortion saw it all! Kurt Cobain had it, Satriani has it, and probably your neighbour too. 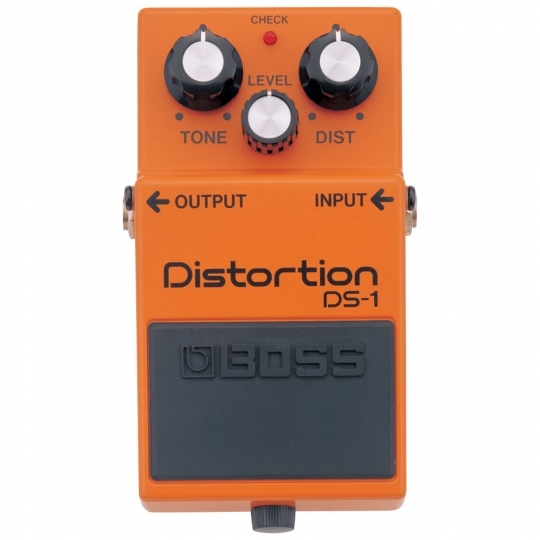 The BOSS DS-1 is without a doubt one of the most famous distortion pedals out there. Since the late '70s and until today, this little orange pedal offers a compressed, British stack style distortion sound with an easy control layout - Distortion, Tone and Level. The BOSS DS-1 is not a subtle pedal but not brutal either, it retains its characteristics with most type of pickups and it is really a great pedal for beginners and pros alike. The BOSS RV-6 offers a lot of reverb in a compact size pedal! The RV series by BOSS was always a successful one. The reverbs were sounding beautiful and musical. The RV-6 takes it one step further with limitless reverb options while keeping the usability simple and intuitive. With the RV-6 you have several reverb types to choose from, such as room, shimmer, hall and plate, reverb level control and an overall tone knob.The thing that made us go "wow" is simply how dynamic the BOSS RV-6 sounds. It feels as if the pedal listens to you and adds the perfect reverb to your signal. It's a Reverb, it's a Delay, It's the BOSS TE-2! Explaining the BOSS TE-2 requires a lot of words, or just a few chords. It is not a straight forward delay or reverb pedal effect but a complete ambient experience. The TE-2 is Powered by Multi-Dimensional Processing technology (MDP) and creates a distinctive echo effect which fattens your sound like no other. A unique feature of the TE-2 is the expressive Freeze function; you can hold a current effect sound to create rich soundscapes for lead playing and sonic exploration. An in-your-pucket Acoustic guitar by BOSS. Often times you wish you had your acoustic guitar with you on stage when if fact, it wasn't. Let's face it, an electric guitar is not always the perfect choice and sometimes a song requires an acoustic guitar. Sadly travelling heavy is not easy for most musicians and often the acoustic is left behind. But then came the BOSS AC-3, an ultra cool acoustic simulator which turns your electric guitar to a sweet acoustic one with a variety of options such as a Jumbo bodied acoustic, piezo pickup sound and more. The AC-3 enjoys BOSS's COSM Acoustic-Modeling technology and thanks to it, the AC-3 sounds pretty much authentic.So no need to worry about that song missing that acoustic guitar anymore...just get the BOSS AC-3 and you're all set. BOSS OS-2 is an ultimate gain pedal which goes from a slight overdrive to a shredding distortion. The sentence "less is more" is often true. But in the case of the BOSS OS-2 it fails. Why? Because the OS-2 is not just one pedal, but two, great pedals in one actually! On one hand it is an overdrive, with all the different levels and the subtleness of an overdrive, and on the other it is a massive distortion. The best is, that you can actually combine both and create your own unique sound. One quality of the OS-2 BOSS points out is, that it's distortion keeps the subtle nuances of a single coil pickup unharmed. We actually liked the OS-2 with both Humbucker and Single Coil guitars, but to see what BOSS talks about chain on the TonePedia player the OS-2 with a Strat and set the pedal to different gain stages. BOSS OC-3, the legendary Octaver by BOSS - better than ever. BOSS is known for being innovative and the OC-3 makes a fine example. On the OC-3 BOSS took the excellent OC-2 channel, which was and still is considered as one of the best Octaver pedals out there, and added two great modes: Drive - adds distortion, Polyphonic - cool polyphonic octave mode. The Drive mode is so organic sounding BOSS really did well with it and the Polyphonic mode is great for when you would like to play chords or set the Octaver to effect a specific range of strings.Wether you're a bass player or an electric guitarist, BOSS got you covered since the OC-3 is working perfectly fine with either. So much more than just a Flanger! With four different thought-out modes and another four sound shaping dials the BOSS BF-3 comes along very versatile. All squeezed into a pedalboard friendly size. Continuing the 20 years of BF-2 legacy, this newer version is a mono in (independent guitar and bass input) and stereo out pedal, enabling you to go for even more striking flanger modulations. Besides the standard and the Ultra mode there's an Gate/Pan mode that slices up your signal while adding the effect. Pretty unique. The momentary mode let's you kick in the flanger for the time the button remains pressed. And last but not least, the BOSS BF-3 has a tap-tempo function which comes in extremely handy on stage. A Special edition of BOSS's very first pedal effect, the legendary CE-1 Chorus Ensemble. The Waza Craft series by BOSS is simply awesome. So little companies invent themselves as well as ROLAND BOSS does, while others try to replicate what they did once upon a time, BOSS tries to make it even better. The Waza Craft pedals enjoy improved all analog circuits using analog bucket brigade (BBD) technology which yields to premium vintage modulation effects. The CE-2W can deliver the classic sought after CE-1 chorus and vibrato sounds, as well as the standard CE-2 sound which was introduced to the market by BOSS in 1979.The CE-2W is an easy pedal to use. Rate and depth control knobs will help you shape your chorus sound to your liking and the 3-way switch will determine the mode you're in. Unlike many custom shop products, Waza Craft pedals, though cost more than the standard models, do not fall within the "expensive" range of pedal effecs. The CE-2W costs round about 200$ which we find more than fair for such a great chorus pedal. The next generation of distortion pedals. One of the most common guitar pedal effect, if not the most common, is the distortion pedal. We guitar players simply love that roaring shredding sound and can't get enough of it. But every guitar player knows, while the distortion pedal sounds great on singular notes and some chords or specific pickup settings, it may sound nonsatisfying on other combination of notes and different pickup settings. We lived with that happily so far since we knew no better, but now there is a way to enjoy it all, it's called the BOSS DS-1X.Unlike a traditional gain pedal, the DS-1X is a digital pedal, powered by BOSS' innovative Multi-Dimensional Processor (MDP). In other words, the pedal analyses your playing in real time and shapes the distortion sound to fit to it. The result is a clear and tight distortion across the entire guitar scale that works with whatever you play, chords or single notes. Thanks to being a digital pedal, the BOSS DS-1X also has a lower ground noise which isn't the case with most distortion pedals. As to how good it sounds in comparison to analog distortions we leave the judging up to you. Just put it against any of the analog pedals offered on TonePedia, set both to 'blind mode' and make your call. Two distortions in one pedal! The twin modes on the BOSS DS-2 Turbo Distortion make this pedal a versatile and interesting one. From blues to 80's distortions and shredding leads, it's all there. The DS-2 is priced lower than 100$ and we found it to be a great option for newbies. Finding as versatile alternative as the DS-2 in this price range is hard. The straight forward layout makes it easy to explore the different tonal options you can get from the pedal. If you end up buying the BOSS DS-2 and tend to use it as a main distortion on your rig, consider purchasing an external foot-switch so you could switch between the two modes while playing. An 'amp-drive' channel in a box. So you have a clean amp you just adore and you want to drive it, what do you do? You get the BOSS ST-2 Power Stack. Three main distortion/overdrive sounds (and endless in between options) will get your drive sound as you want it. When setting the 'Sound' control to 'Crunch' you will get a slightly driven amp sound and the more you dial the control clockwise the more distorted your sound will get. The BOSS ST-2 feels very organic and we really think it is a great pedal effect. BOSS MD-2 â An "in your face" distortion! The MD-2 is a vicious dual gain distortion, period! It has healthy bottom and slicing top, a lot of gain and colour. The interesting thing about the MD-2 is the additional 'gain boost' it offers, dial it clockwise to thicken your distortion sound even more. No matter on what level stage you play, the BOSS MD-2 will deliver a crushing distortion with an endless sustain. BOSS BC-1X, a multiband compressor for the discerning bass player! Making a good compressor is a tough thing. Getting the extremes (light compressing / hard compressing) is the easy part and most compressors have no problem there, the middle does the difference. Keeping an organic, natural sound, yet compressed is where it gets tricky and there the BOSS BC-1X excels. big time!Playing the BOSS BC-1X actually made us feel "naked" once we bypassed it. Through the pedal, the clear sound of our bass was not deteriorated or lost, it was simply enhanced, had more balance and overall thickness which is exactly what a good compressor should do. The BC-1X is extremely dynamic, it feels as if it "listens" to you playing. While it is indeed a clean compressor, if you want to, you can push it to saturate slightly. Here is how you do it: set it to maximum ratio /minimum threshold /minimum release and play hard and you're all set. Check out the dynamics demo to hear this setting.As all BOSS pedals, the BC-1X is built like a tank and user friendly. Much more than a typical bass overdrive pedal. It is punchy, extremely dynamic and it is called the BOSS BB-1X Bass Driver. Unlike the infamous BOSS ODB-3 which was designed to deliver 24/7 pumped up distortion, the BB-1X works as a preamp which reacts to your playing. It can be used to thicken the dry bass tone, revive it and of course get you to distortion haven. We found the BB-1X to be pretty natural sounding. As always with BOSS, there is no fear in taking the BB-1X on the road, it is build like a tank. A modern era overdrive pedal. The OD-1X launches the famous BOSS overdrive into a modern era of expression, delivering an unmatched level of performance for guitarists with an ear for tone. This next-generation stomp combines over 35 years of innovation in pedal design with the most advanced technologies, bringing you a completely new tonal experience thatâs only possible with the legendary expertise of BOSS. Prepare to be amazedâthe inspiring and ultra-responsive OD-1X will change your thinking about overdrive pedals forever. Creamy, yet crunchy... The BOSS BD-2 has gained popularity among guitar players as it is good and inexpensive. Many guitar players bought the BD-2 as their first overdrive pedal and they were not wrong! it is a nice overdrive pedal for an even nicer price. Getting the BD-2 to sound good is an easy task, with knobs like gain and tone you can't really go wrong and in general the pedal is pretty much player friendly, it sounds good and creamy. The gain of the BOSS BD-2 is all in all subtle to mid-harsh, it can be crunchy but will not distort, hence the name, Blues Driver. Low on controls, High on sound. The BOSS FZ-5 is a simple yet complex sounding fuzz pedal. Three Fuzz modes, one gain and one volume knobs are all you get, but the sound possibilities of this pedal are surprising. It can sound as classic, germanium based fuzz pedals, to an overdriven, boosted and aggressive fuzz.The Different modes on the BOSS FZ-5 are designed after three famous vintage Fuzz pedals:Mode 1 â Dallas Arbiter Fuzz FaceMode 2 â Maestro FZ-1AMode 3 â Roger Mayer Octavia Try the different modes to get the kind of Fuzz you are after and let it rock! So much overdrive for so little money! No wonder it is an industry standard. Searching the net for the BOSS SD-1 results in finding users describing it as "underestimated" "My best purchase" "My go to overdrive" and more praises. The BOSS SD-1 is a good sounding, warm, mid gain overdrive pedal with an outstanding price tag of 49,99$. crazy!Thanks to a unique asymmetric overdrive circuit, the SD-1 replicates the distortion of an overdriven tube amp which is great for rock and blues. Aside for the gain control you will find on the SD-1 the traditional tone and level controls. It is built, as always with BOSS, like a tank and ready to rock! The BOSS CS-3 has been around since the 80's, it is an analog compressor pedal that compresses louder notes and boosts the lower ones, while keeping your original tone authentic. From gentle compression to hard one, you can get it all from the BOSS CS-3. The Compression Sustainer has low noise and equipped with an EQ knob in case you would like to fine tune your tone. It is built to last and works well with both electric and bass guitars. Not just a phase. One of the very first BOSS pedals to hit the market back in 1977 was the PH-1 Phase Shifter. The BOSS PH-3 is the successor of the scarce PH-1 model which was discontinued in 1981. Unlike the PH-1, the PH-3 is a digital pedal, that gives the player a much greater control and array of sound options. A mode switch allows you to choose between 4, 8, 10 and 12-stage phases as well as Rise and Fall modes (so always going up or always going down) and a wild step mode that applies sweep cycle that proceeds in "stairstep" (easier heard than explained). Thanks to tap tempo and optional expression pedal features, it is safe to say that the BOSS PH-3 delivers the best of both vintage and modern worlds. BOSS goes metal with the ML-2. The ML-2 is BOSS's heaviest distortion pedal ever. This pedal is a wall of distortion, it delivers tons of gain and is great for Grind-Core, Nu-Metal and other metal genres which requires massive distortion sounds. The tone knobs (Low,High) help you EQ the sound to your liking, from mega low boost for power chords and mutes to slicing highs when shredding. If you're in the market for an in your face metal pedal, the BOSS ML-2 is your thing. A legendary BOSS pedal, reborn. The vintage BOSS VB-2 Vibrato pedal is a sought after one by vintage pedal collectors. It was released in 1982 and was considered already back then to be unique due to it's pitch shifting vibrato sound. The Waza Craft version replicates that unique sound but also adds some nice additions as real-time depth controlling via an expression pedal, unlatch mode (hold bypass=pedal on) for adding vibrato to specific sections and an additional vibrato mode with a unique filter wave. The BOSS VB-2W sports an all analog BBD circuit. It's a BOSS...... it's a JHS...... it's massive! When two great companies as BOSS and JHS join forces, the outcome is ought to be great. The JB-2 Angry driver stands in the expectation, it is one of the most versatile overdrive pedals we have encountered. The JB-2 unites two famous pedals into one standard BOSS size pedal: the BOSS BD-2 Blues Driver and the JHS Angry Charlie. Each pedal is controlled using dedicated Drive, Tone and Volume knobs while an additional Mode selector enables to engage each pedal separately or different combinations of both. the result is a wide array of tonal possibilities. There is really no better way to understand the capabilities of the BOSS JB-2 than experiencing it in our player. One of BOSS's most collectible pedal effects, now as a WAZA. Since its end of production in 1989, the BOSS DC-2 became a sought after pedal effect among collectors. The back then weird pedal which offered 10 presets combinations, was designed based on the famous Roland SDD-320 Dimension D rack. With more and more players seeking for it, BOSS did us all a favor and revived the DC-2 within their WAZA CRAFT series, calling it DC-2W Dimension C. The DC-2W is quite a sophisticated pedal effect. It is in fact not exactly a chorus as some might think, but a depth & width enhancer to your dry signal, creating a 3D feeling. If after reading the last sentence you ended up asking yourself "what?" - go play with the BOSS DC-2W Dimension C on the TonePedia player. Words can confuse, sound never lies. The revival of the Metal Zone. The original BOSS MT-2 Metal Zone is by far one of the most iconic distortion pedals out there. Thanks to its slashing trebles and "in your face" sound, guitar players around the world either love it or not, there is no middle when it comes to the MT-2. BOSS decided to update the MT-2 under their successful WAZA CRAFT series and the result is, as expected, fantastic. The BOSS MT-2W consists of two channels. The S channel and C channel. The S is basically the standard good old MT-2 we all know, while the C one is a fatter, deeper, fuller channel, which provides more clarity and meat than the traditional MT-2. The EQ of the pedal, which effects both channels, has been refined as well and delivers smoother mid range and overall control over your sound. When BOSS asked to send it for demos we were intrigued, how will the WAZA version of such a controversial pedal will perform. We now can say that we are satisfied with the BOSS MT-2W Metal Zone. We like the extremes this pedal can deliver and the added custom channel really seals the deal for us. But hey, add it to the player and try it for yourself.